Data visualizations increasingly inform our daily decisions. Traffic visualizations inform which route to take to the office, business intelligence dashboards indicate how you’re doing on projects and key performance indicators. And data collected by fitness trackers tell you how close you are (or aren’t) to reaching your weight loss or fitness goals. Each of these domains (transport, performance, fitness) use different kinds of visualizations and may require different decision processes and frameworks. While there’s been significant research on data visualizations on decision making in isolated domains, there hasn’t been a much research around cross-domain research in an attempt to uncover a common cognitive decision-making framework. That is, until recently. Over the last 30 years, the dominant decision-making theory into how humans make risk-based decisions has been the dual-process theory. In the first process, humans make reflexive, intuitive decisions with little consideration. This is also called Type 1 processing. Type 2 processing is more deliberate and contemplative. The two types of decisions were made famous by Daniel Kahneman in “Thinking, Fast and Slow.” There have also been some proposals that these two types are a gross oversimplication of how the human brain makes decisions and the reality is closer to a spectrum of decision-making, based on required attention and working memory. The researchers discovered four findings as part of the review. The first two are impacted by Type 1 processes; the third by Type 2, while the fourth appears to be impacted by both. Things like colors, edges, lines and other foreground information can cause involuntary shifts in attention (bottom-up attention). This may cause viewers of a visualization to focus on things like icons while missing task-relevant information. 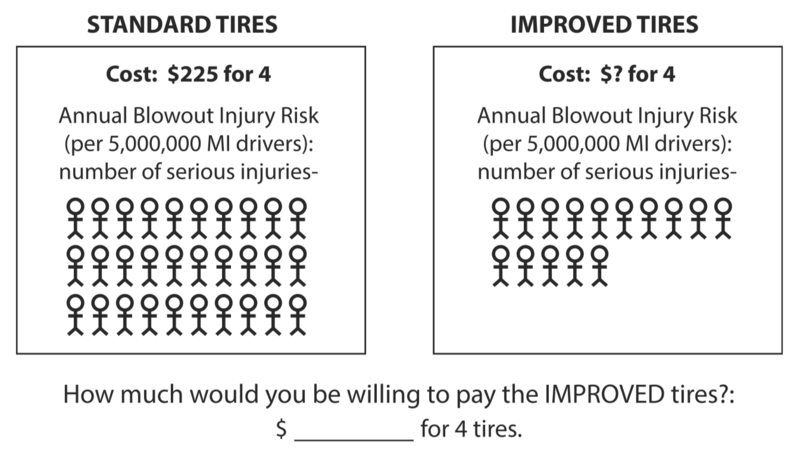 In one example, reproduced from the original document, some viewers were willing to pay $125 more for tires when viewing the visualizations versus viewing a textual representation. Bottom-up attention has a significant influence on decision-making, but it’s also a Type 1 task that likely influences the initial decision-making process. Like the previous finding, these visual-spatial biases are a Type 1 process occurring automatically. “Cognitive fit” describes the alignment between the task or question and the visualization. In other words, is the visualization formatted in such a way that it facilitates answering the question being asked. The researchers used the example of finding the most significant members of a social media network. When the graph was formatted in a way that didn’t facilitate the task, participants with less working memory capacity performed the task more slowly than those with greater working memory. When using a visualization optimized for the task, there was no difference in task completion times. The last finding is that the knowledge that a person possesses can impact how the visualization is used, triggering biases or allowing viewers to use existing expertise. Knowledge might be temporarily stored in working memory or held in long-term memory and used with some effort (both Type 2), or stored in long-term memory and automatically used (Type 1). The model the researchers developed adds working memory to a previously existing model of visualization comprehension. Working memory can influence every step in the decision-making processe, except bottom-up attention. Create visualizations that identify the critical information needed for a task and using visual encoding techniques to direct attention to that information. Use a saliency algorithm to determine the elements in a visualization that will likely attract viewers’ attention. Try to create visualizations that align to a viewer’s mental “schema” and task demands. Ensure cognitive fit by reducing the number of mental transformations required in the decision-making process. Overall, this is excellent work that should be top of mind for anyone using and presenting data visualizations to decision-makers.